Togo is a small West African country with a stagnant economy in a state of political uncertainty. Tourism facilities are limited, especially outside the capital city, Lomé. Read the Department of State Background Notes on Togo for additional information. Travelers are encouraged to obtain visas prior to arrival due to recent difficulties with requesting them at the airport in Lomé or at some of the land borders. Visas issued in Togo are limited to 7 days and can take an hour or more to be issued. Travelers applying for visa extensions can also experience significant delays. Vaccination against yellow fever is required before entry. U.S. citizens should carry copies of their U.S. passports and vaccination records with them at all times while traveling in Togo so that, if questioned by local officials, they have proof of identity, U.S. citizenship, and required vaccinations readily available. Overseas, inquiries should be made at the nearest Togolese embassy or consulate. U.S. citizens are urged to avoid political rallies, street demonstrations, and maintain security awareness at all times. Togo has experienced periodic violence, strikes, and political tensions since 1990. Following the death of President Eyadema in February 2005, political activists took to the streets and held demonstrations throughout the country that resulted in more than 500 deaths. Land borders with Ghana and Benin are routinely shut down during elections. The October 2007 legislative elections were non-violent with only minor incidents reported during the single post-election demonstration. The next major elections are the presidential elections scheduled for 2010. Over the past year, Togo has seen a marked increase in incidents of violent crime throughout the country, including several recent machete attacks in poorly lit areas of Lomé. Rapid inflation and food shortages have contributed to increases in already critical crime levels in urban areas. Particular areas for Americans to avoid within Lomé, especially during the hours of darkness, include the Grand Marché area, the beach road, and the Ghana-Togo border areas. Travelers should avoid the beach even during daylight hours as purse-snatchings and muggings occur there regularly. Pick pocketing and theft are common in Togo, especially along the beach and in the market areas of Lomé. While incidents of residential burglary are less common against foreigners, carjacking is on the rise, and even western diplomats have been victims of carjacking. Theft while riding in taxis is also increasing, as thieves steal bags, wallets, and passports. Taxicabs should not be shared with strangers. Formerly associated with Nigeria, these fraud schemes are now prevalent throughout western Africa, including Togo, and pose a danger of both financial loss and physical harm. An increasing number of Americans have been the targets of such scams, losing anywhere from several thousand to several hundred thousand dollars. Typically, these scam operations begin with an unsolicited communication, usually by e-mail, from an unknown individual who describes a situation that promises quick financial gain, often by assisting in the transfer of a large sum of money or valuables out of the country. an American must pretend to be the next-of-kin to a recently deceased Togolese who left a fortune unclaimed in a Togolese bank, or a person claiming to be related to present or former political leaders needs assistance in transferring large sums of cash, or even a business deal that appears to be legitimate. The requests are usually for the payment of advance fees, attorneys’ fees, or down payments on contracts. The final payoff does not exist; the purpose of the scam is to get any money possible and to gain information about the American’s bank account. The best way to avoid becoming a victim of advance-fee fraud is common sense – if it looks too good to be true, it probably is. You should carefully check out any unsolicited business proposals originating in Togo before you commit any funds, provide any goods or services, or undertake any travel. Please check the Embassy web site at http://togo.usembassy.gov/ for the most current information on fraud in Togo. For additional information, please see the Department of State brochure on International Financial Scams. The local equivalent to the “911” emergency line in Togo is: 117 or 171 for police, 172 for Gendarmerie, 242 for the Pharmacy on Duty, and 118 for Fire Services. Medical facilities in Togo are limited and of very poor quality, with no adequate emergency medical care. Availability of medications through local pharmacies is unreliable, and travelers should carry all necessary medications, properly labeled, with them. Malaria, a serious and sometimes fatal disease, is prevalent in Togo. For information on avian influenza (bird flu), please refer to the Department of State's Avian Influenza Fact Sheet. According to the Togolese Ministry of Foreign Affairs and Ministry of Health, there are no HIV/AIDS entry restrictions for visitors to or foreign residents of Togo. The information below concerning Togo is provided for general reference only, and may not be totally accurate in a particular location or circumstance. While some major thoroughfares in urban parts of Togo are paved, many secondary streets are not, and become severely flooded every time it rains. Driving conditions are hazardous throughout Togo due to the presence of pedestrians, large numbers of small motorcycles, disorderly drivers (moped, car and truck drivers), livestock on the roadways, and the poor condition of the roads, including deep potholes. Overland travel off the main network of roads generally requires a four-wheel-drive vehicle. Many drivers in Togo do not obey traffic laws and most traffic signals do not function properly. Drivers should be prepared for other vehicles to run red lights or stops signs and drive in the wrong direction on one-way streets. Nighttime travel on unfamiliar roads is dangerous. Poorly marked checkpoints, often manned by armed, undisciplined soldiers, exist throughout the country, including in the capital. Banditry, including demands for bribes at checkpoints, has been reported on major inter-city highways, including the Lomé-Cotonou coastal highway. Travelers are advised to be aware of their surroundings and to drive defensively. At official checkpoints, Togolese security officials prefer that you approach with your dome light on, and have your driver’s license, registration, and proof of insurance ready. Americans should be aware of the staged-accident ploy when driving in Lomé. In this scam, a motorbike will cut in front of you, cause a collision, and draw a crowd, which can turn hostile if you attempt to leave the scene of the so-called accident. Such encounters appear designed to extort money from the vehicle driver. Pedestrians also cause staged accidents. Genuine accidents can also draw hostile crowds. Travelers should drive with their car doors locked and windows closed, and have a cell phone in the vehicle. If you are involved in this kind of accident and can drive away, you should leave the scene, drive to a safe location, and alert both the police and the U.S. Embassy. Violent carjackings are periodically reported in Togo and tend to increase during the summer months and holiday season. Travelers are advised to exercise caution when using any form of local public transportation. Never get into a taxi with unknown passengers and always agree on the fare before getting in. Visit the web site of the country’s tourist office at http://www.togo-tourisme.com/. As there is no direct commercial air service to the United States by carriers registered in Togo, the U.S. Federal Aviation Administration (FAA) has not assessed Togo’s Civil Aviation Authority for compliance with International Civil Aviation Organization (ICAO) aviation safety standards. Power outages, voltage fluctuations, and water shortages are common throughout the country. Only certain U.S. credit cards are accepted in Togo. Most major hotels and their restaurants accept American Express, MasterCard, and Visa, while smaller hotels and restaurants do not. Travelers planning to use credit cards should know which cards are accepted before they commit to any transaction. Travelers should keep all credit card receipts, as unauthorized card use and overcharging are common. There are some Automatic Teller Machines that dispense local currency in major banks and they are generally considered safe. Well-known money transfer firms, including Western Union, operate in Togo. Photographing places affiliated with the government of Togo, including official government buildings, border crossings, checkpoints, police stations, military bases, utility buildings, airports, government vehicles, and government or military personnel, is strictly prohibited, and local authorities will confiscate film and cameras. Government buildings are not always clearly identifiable, as they vary from being very well marked to being not marked at all. Persons violating Togo’s laws, even unknowingly, may be expelled, arrested or imprisoned. Penalties for possession, use, or trafficking in illegal drugs in Togo are severe, and convicted offenders can expect long jail sentences and heavy fines. Americans living or traveling in Togo are encouraged to register with the nearest U.S. Embassy or Consulate through the State Department’s travel registration web site so that they can obtain updated information on travel and security within Togo. The U.S. Embassy is located on Boulevard Eyadema, Neighborhood Lomé II, Lomé; telephone (228) 261-5470, fax (228) 261-5499. The local mailing address is B.P. 852, Lomé. This replaces the Country Specific Information for Togo dated March 3, 2008, to update the sections on Crime, Information for Victims of Crime, and Medical Facilities and Health Information. 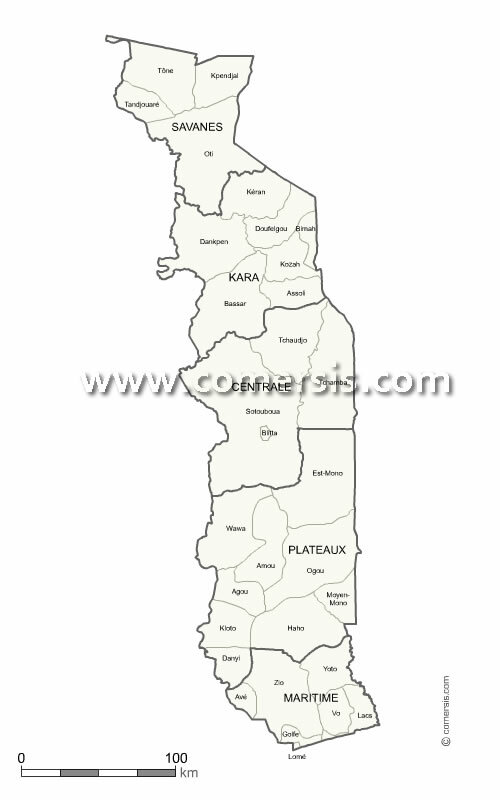 The Togo government confirmed last week [week of 1 Jan 2019] a Lassa fever case reported in Doufelgou district [Kara region] in the north of the country, according to a Agence de Presse Africaine report (computer translated). This was a haemorrhagic fever case according to officials. Lassa fever is a rare but potentially life-threatening viral haemorrhagic disease. The risk of infection is low but can occur if someone comes into contact with an infected person's blood or bodily fluids. Lassa fever cannot be spread through casual contact, including skin to skin contact, without exchange of bodily fluids. Those at highest-risk would be health care workers treating patients in facilities known to have Lassa fever and family members caring for infected patients. Early diagnosis and supportive care are essential. One should consult a medical professional if he or she has been in direct contact with an infected person within the past 3 weeks and have symptoms of Lassa fever, which include: fever, chest, stomach or back pain, cough, vomiting, diarrhoea, or mucosal bleeding. - strengthening of cross border collaboration and information exchanges between Togo, Burkina, Mali, and Benin. It seems odd that the case report above does not mention contact with rodent reservoirs of the virus or their excrement as a source of infection. Lassa fever virus is transmitted to humans from contact with food or household items contaminated with excreta of multimammate rats (_Mastomys_ spp), the reservoir host. Public education is an important measure to prevent infections in the home. Lome, Sept 24, 2018 (AFP) - A former lawmaker in Togo was on Monday on hunger strike to call for the release of opposition supporters who were arrested during anti-government demonstrations. Nicodeme Ayao Habia, head of the Democrats party, began his protest six days ago in front of Ghana's embassy in the Togolese capital, Lome. "I am on hunger strike to demand the release of all people who were arrested during protests by the opposition coalition who are still languishing in prison," he told AFP. "I won't move from here as long as these people are in prison," he said, holding a small sign with photos of three of those detained. "This morning, police tried to move me along but I refused as I am within my rights. They even tried to rough me up." Habia held a two-day hunger strike previously this month in front of the US Embassy in Lome. Some 44 people who were arrested during opposition protests against President Faure Gnassingbe and his government remain in prison, according to the coalition. The oppositions wants the re-introduction of a two-term limit for presidents, applied retroactively, which would prevent Gnassingbe from standing for re-election in 2020. The government has agreed to the two-term limit but not the retroactive element, which would allow the president to stand at polls in 2020 and 2025. He has already been in power since the death of his father, Gnassingbe Eyadema, in 2005. The army general seized power of the West African state in 1967. As well as the release of opposition detainees, Habia said he also wanted the government to stick to the roadmap set out by leaders of the West African bloc ECOWAS. "The regime must absolutely respect the recommendations contained in the ECOWAS roadmap," he added. On Sunday, the government and opposition finally agreed common ground in the composition of the country's independent national electoral commission (CENI). Lack of agreement about the make-up of the body had delayed an announcement of the date of local and parliamentary elections. Local polls and a referendum on the proposed constitutional reforms will now take place on December 16, with parliamentary elections four days later. Lome, Jan 31, 2018 (AFP) - Togo's government was facing fresh turbulence on Wednesday as healthcare workers went on strike, joining thousands of demonstrators holding opposition protests on the streets. The two-day nationwide strike was called by the National Union of Hospital Practitioners of Togo (SYNPHOT) who are demanding better equipment and more nursing staff. "The strike is well-followed throughout the country. We will take stock tomorrow evening to know what to do in the coming days," SYNPHOT secretary-general Atchi Walla told AFP. At Sylvanus Olympio university hospital, the country's largest health care centre, several departments were closed, according to an AFP journalist. "We are here only for very urgent cases. The other patients will be rescheduled," said a worker at the entrance to the emergency surgery department. There was a similar situation in the operating room and at reception, where only one person was working. "This situation is tiring. I came to get treatment but nobody can help because they are on strike," said Albert Kudju, a retired civil servant. "The authorities should meet the demands of the workers." Primary and public school teachers are also on strike, demanding an increase in their wages, while students are protesting against a sharp rise in tuition fees. The walk-outs come against a backdrop of widespread discontent with the government and opposition calls for the resignation of President Faure Gnassingbe. Gnassingbe has been in power since 2005 and took over from his father, General Gnassingbe Eyadema, who himself ruled Togo for 38 years. A coalition of 14 opposition parties has been organising almost weekly marches for the past five months. Lome, Sept 20, 2017 (AFP) - Thousands thronged the streets of Togo's seaside capital Wednesday after the ruling party asked supporters to march at the same time as planned opposition protests demanding the removal of President Faure Gnassingbe, the scion of Africa's oldest political dynasty. The rival demonstrations in Lome came a day after the opposition boycotted a vote on constitutional reform which would have included a presidential term limit, arguing that it was a ploy to let Gnassingbe remain in power till 2030. The opposition wanted the limit to apply retroactively so that Gnassingbe, who has been in power since 2005, could not run again in 2020. His father Gnassingbe Eyadema ruled from 1967 till his death in 2005. The opposition marches began at around 11:00 am (1100 GMT) at three meeting points. They came after giant rallies on September 6 and 7 seeking the president's ouster that drew more than 100,000 people on the streets -- a record in a country which has been widely criticised for stifling democracy. The protesters held up posters declaring "Faure must go" and "Free my country, 50 years is enough". Police and soldiers armed with heavy machine guns flanked the streets in pick-up trucks. Mobile phone networks and 3G services appeared to have been severed. "We are not jihadists, we are not rebels," said Abdallah, 42, a supporter of the Panafrican National Party (PNP). "We just want democracy, we are tired." Communications Minister Guy Lorenzo condemned what he called a "coup d'etat" on the streets. The government meanwhile asked the opposition to show "responsibility and restraint" and warned that "people of foreign nationalities were looking to participate in acts of violence" during the marches. More protests are planned on Thursday against what veteran opposition leader Jean-Pierre Fabre called "the monstrous machine that has been crushing Togo's people for more than 50 years". He said there would be "no let-up" as long as Gnassingbe remains in power. Comi Toulabor, head of research at the Institute of Political Studies in Bordeaux, called the counter-rallies by the ruling Union for the Republic (UNIR) party "a strategy to disrupt the opposition protest". "It's very amateurish but it shows the party isn't ready to give way," he told AFP, calling the situation "explosive". About one thousand UNIR supporters quietly gathered on the beach in Lome on Wednesday, some sitting in the shade of palm trees. "It is a pleasure to be here," UNIR supporter Georgia, 34, told AFP. "We are peaceful." One young protester said he received 5,000 CFA francs (7.50 euros, $9) to participate in the pro-government rally. "You think we're here for politics?" asked Justin, 17, as his friends nodded approval. The failure to pass the constitutional reform bill in parliament forced a referendum, which a member of the government said will be held in the coming months. Gnassingbe has now won three elections, the results of which have been contested by the opposition. Half of Togo's population lives below the poverty line, according to the United Nations, despite a GDP growth rate of five percent over the last three years. Since [Sun 1 Jan 2017], 201 suspected cases of meningitis with 17 deaths were reported by 19 health districts. In week 2, the district of Akebou, which is part of the Plateau Region, issued an alert after 4 cases of meningitis were reported. In week 4, the epidemic threshold was reached with 9 cases and an attack rate of 12.4 per 100,000 inhabitants. From 2 January to 12 February 2017, 48 suspected meningitis cases with 3 deaths were reported (case fatality rate of 6.3 percent). Of these, 14 specimens were confirmed as _Neisseria meningitidis_ serogroup W by PCR. Togo is part of the African meningitis belt and documents cases and deaths due to meningitis every year. In 2016, the country recorded an epidemic in the northern part caused by _Neisseria meningitidis_ serogroup W. A total of 1975 cases and 127 deaths were reported in 2016. - 56,000 doses of meningitis vaccines have been requested from the International Coordinating Group (ICG) for the planned vaccination campaign. - WHO Field Mission was deployed in the field to strengthen outbreak management. - Strengthening of meningitis surveillance at the district level. - Training of clinicians at the district level on case management. - Conducting cross-border meetings with Ghana and Benin. The largest burden of meningococcal disease occurs in the African meningitis belt. Although the successful roll-out of MenA conjugate vaccine has resulted in the decreasing trend of meningitis A, other meningococcal serogroups are shown to have caused epidemics. This report of the _Neisseria meningitidis_ W outbreak in Togo calls for a close monitoring of the changing epidemiology of meningococcal disease. There is a need to ensure that global stocks of vaccines are available, laboratory and epidemiologic surveillance systems are strengthened and outbreak response strategies in the countries are on hand. [Although there are at least 13 _ Neisseria meningitidis_ serogroups, based on the antigenic specificity of their capsular polysaccharides, disease due to serogroups A, B, C, Y, and W are most common. There are vaccines that contain capsular polysaccharide (A, C, Y, W), either alone or conjugated to protein. Conjugate vaccines are preferable, because, unlike the polysaccharide vaccines, conjugate vaccines immunize infants, reduce the carriage of meningococci in the throat and thus its transmission, as well as confer a more sustained immune response, and, therefore, longer-term protection than the polysaccharide vaccines. Serogroup B vaccines are based upon meningococcal B outer membrane vesicle protein antigens, because group B polysaccharide is poorly immunogenic in humans and is a potential auto-antigen. Immunity following use of a meningococcal vaccine is specific for the type of capsular polysaccharide the vaccine contains in regard to the A, C, Y, and W polysaccharide vaccines or the surface proteins in regard to serogroup B vaccine, with no cross-protection against infection due to other meningococcal groups. Following the mass introduction into the population of a vaccine specific for one particular meningococcal serogroup, the incidence of disease due to that serogroup has been found to fall dramatically, e.g., serogroup C disease in the UK following the introduction of C vaccine and serogroup A in the African Meningitis Belt following A vaccine, only to be replaced by emergence of disease due to other meningococcal serogroups. In view of replacement of meningococcal serogroup A with other serogroups, in the current case serogroup W, following mass vaccination of the population with serogroup A conjugate vaccine in Togo, reactive mass vaccination to control this outbreak would require use of a meningococcal vaccine containing serogroup W, e.g., the conjugate ACWY vaccine. However, the news article above fails to say what vaccine is being used. ProMED-mail would appreciate more information in this regard from knowledgeable sources.